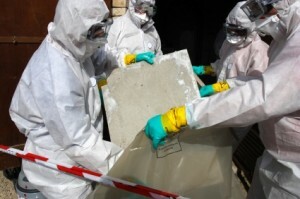 HomeSafety Consultancy Energy/ Environment Why is asbestos dangerous? are responsible for around 4000 deaths a year. lung cancer (almost always fatal),asbestosis (not always fatal, but it can be very debilitating)and diffuse pleural thickening (not fatal). Asbestos fibres are present in the environment so people are exposed to very low levels of fibres. However, a key factor in the risk of developing an asbestos-related disease is the total number of fibres breathed in. Working on or near damaged asbestos-containing materials or breathing in high levels of asbestos fibres, which may be many hundreds of times that of environmental levels can increase your chances of getting an asbestos-related disease. Asbestos related diseases won’t affect immediately but later on in life, so there is a need for you to protect yourself now to prevent you contracting an asbestos-related disease in the future. It is also important to remember that people who smoke and are also exposed to asbestos fibres are at a much greater risk of developing lung cancer. Find out more – Click here to go to our website!